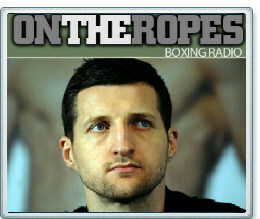 Click to listen to the Carl Froch interview in its entirety now! Ever since Carl Froch’s one sided victory over Lucian Bute one question has been asked. That question ‘Who’s next?” In part two of my exclusive ‘On The Ropes’ boxing radio interview with Carl Froch I focus on his upcoming November 17th title defense against former Light heavyweight contender Yusaf Mack. Carl gave his views on choice of Yusaf Mack as an opponent, how he feels about the big names that turned down a fight with him, thoughts on a potential rematch with Mikkel Kessler, prediction for his next bout and how he ultimately wants to be remembered by boxing fans. Here is what Carl had to say. Jenna Jay: Carl it was recently announced that you will be taking on Yusaf Mack in the first defense of your IBF title belt. How do you feel about the fight? Carl Froch: I think it’s a great fight. He is ranked now #5 IBF at light heavyweight, and is a credible opponent, there were couple of fighters out there that didn’t want to take the fight, the immediate rematch with Bute never happened because Bute didn’t want the fight, Kessler wasn’t really making the right noises, and I think he was unrealistic with the amount of money he wanted to be paid, so that fight never happened, so I am happy that Yusaf Mack stepped up to the plate and fancied the challenge. So I think its going to be a great fight and I can’t take him lightly because he is a strong light heavyweight whose going to come and try to win so I have to be very careful and I have be on my A game. Jenna: There were a lot of big names being tossed around like Kelly Pavlik, and Mikkel Kessler, but both turned the fight down. Do you think that money was the reason, or do you think they really did not want to fight you? Froch: It’s usually what people do if they don’t really want to fight, instead of saying I don’t want the fight, they’ll just ask for too much money. Mikkel Kessler is a very proud man, and he beat me fair and square in the first fight, it was very close, it was in his hometown, so I could say he got a home town decision, but that’s what the sport is all about it happens, so I am not going to complain about, its a fight I think I could win, and it’s a fight Mikkel Kessler knows that I could win, so but anyway regardless of that the fight is not happening, you know the fight may happen in the future, but the fight may happen in the future, but for now it’s Yusaf Mack in my back yard again, and I am looking to put on another fantastic show. Jenna: Yusaf Mack has been knocked out in each of his losses. If you do not score a KO would you consider that a disappointment? Froch: No not really. You know you have to give the guy respect, he is coming down from light heavy weight, he is a big strong man, I am not going in there looking to knock out him, he may have different plans, to about what he is looking to do with me, but you know I never really look for the knock at this stage in my career now I am wise enough to realize the knock out comes if the timing is right and your boxing correctly jab and doing all right things like against Lucian Bute. I am not in rush, to do anything silly or take any chances, I am in there to do a job, my job is to beat Yusaf Mack by any means necessary, and the knock out will come but I am not going in there looking for it. Jenna: Carl, after November 17th, what do you see as your next move? Froch: Beat Yusaf Mack, rematch with Bute and a rematch with Mikkel Kessler would be very nice, so it would be nice to avenge that defeat to be honest, but whether or not that happens remain to be seen. Jenna: Seeing as you mentioned Mikkel Kessler, people are suggesting that he’s not quite the fighter he used to be based on how he looked in his last two fights. Do you think you will be getting a weaker version of Kessler if you do get him in a rematch? Froch: I don’t know about that, I think people prepare for differ fighters in different ways, Kessler was probably ill prepared for these fighters because he may not have put them in high regards, so for me to say oh I would get a weaker mike Kessler would be ignorant, arrogant, and ?...So no to your answer questions. Jenna: What would you do different in a rematch with Kessler? Froch: I think a lot of things would be different. In to the build up of the fight, to the fact that I would be traveling over there very late due to the volcanic ash cloud canceling my flight 2 weeks prior to the event, I would have a lot more, road work in the bank, without a few problems. I don’t want to talk about problems with injuries, because it looks like I would be making excuses, but the things that I would different would be the things that would make me win the fight and I am telling you if I had a rematch with Mikkel Kessler, and he will probably read this and play it, and I have nothing against the guy, he is gentlemen and I consider him a friend, but if I get in the ring Mikkel Kessler there is only one winner and that’s the cobra! That’s the fight I will win regardless of what I do differently or how I prepare, I will win the fight and its going to be a fight fans absolutely relish. There is millions of fans that want to see that fight made, and that’s the fight that should happen before I retire. Jenna: Back to your fight with Yusaf Mack. What do you believe you will need to do on the night to come away with the victory? Froch: Well I can’t give possibly give away my tactics. And what I planning on doing to get the victory. You know I just have to do what I do best, that’s getting in there and be brutally rough busy punching hard not getting hit back. And ill get the win, simple as that. I mean I need to have a couple of look at him, to see what his style was, what his favorite shots are, what he does well and what he does bad, and I will exploit his weakness, and I’ll make sure I am at full strength and ill do the business and the fans are in for a treat. He is a strong lad, he didn’t get a world ranking like his got for no reason, and he’s going to come and try to upset the cobra and try to get the world title. However you may see him in the past you may see him a little bet better, but no concern for me, I’ve been there seen it and done it all, I plan on getting in there putting a good show for the fans the television broadcaster and retaining my title in style. Jenna: Carl speaking of the fans. When it’s all said and done, and you hang up your gloves, how do you think the boxing fans will remember you? Froch: There going to remember me as a no nonsense kind of a fighter, someone who takes on all comers, who fear nobody. I am prepared to travel out of my hometown, out of England, over to America Denmark Finland, so I will be remembered as a fighter who fought everybody, fought the best of the best, wasn’t afraid to fight the best and did very well. 3x world champion, maybe become 4x world champion if I win another tile. I am going to get a lot of respect, and how people will remember personally it’s for them to decide. I can’t speak for the people canI? I can only speak for myself. I am going too retire with a lot of respect based on the love and respect I am getting now, from both side of the Atlantic, I am proud of what I have achieved and all my fans are too. Special thanks to Tim for helping bring this interview to boxing readers. FOR PART ONE CLICK HERE .